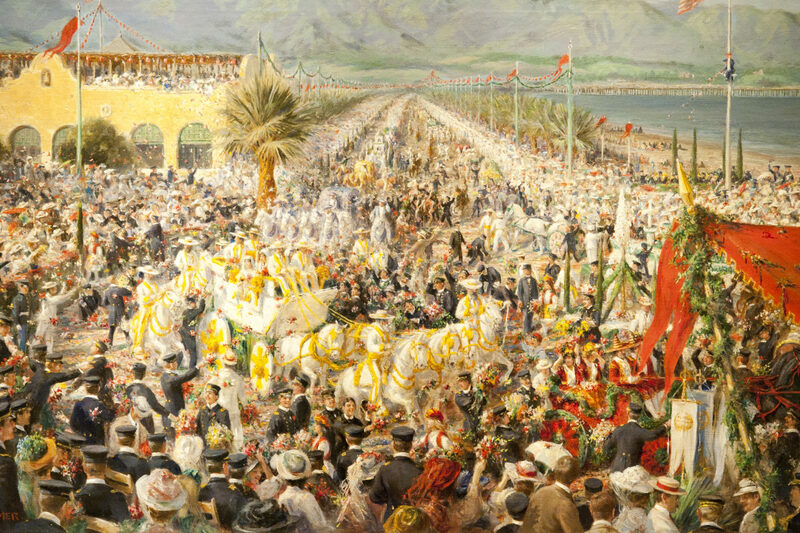 On April 25, 1908, Santa Barbara welcomed the Great White Fleet and it’s estimated fifteen thousand sailors with a tremendous Battle of the Flowers celebration parade on the Santa Barbara waterfront. The sixteen white battleships had been ordered by President Theodore Roosevelt in 1907 to cruise around the world on a peacekeeping mission. Upon its arrival, the fleet demonstrated its navigational skill by steaming into Santa Barbara in the tightest formation that battleships had ever achieved up to that time. The Fleet Festival continued for several days. The palatial Punta del Castillo (Castle Point), was considered one of the most elaborate residences built in Santa Barbara during the late nineteenth century. The Italianate-styled mansion was designed by the city’s premier architect, Peter J. Barber, and completed in 1886. Here the Dibblees entertained in grand style. Designed for Mercedes Dibblee Poett, from her mother, Francisca. In 1868, Thomas Bloodgood Dibblee married Francisca de la Guerra, whose marriage signified the blending of Spanish and Anglo-American cultures in Santa Barbara. Francisca was born in Casa de la Guerra in 1848, and was a granddaughter of Don José de la Guerra. During her lifetime, Francisca Dibblee perpetuated the traditions of old California in song and dance that had passed down through the de la Guerra family. She was known to regale her guests with her repertoire of nearly 150 folk songs performed on her beloved guitar. Thomas and Francisca de la Guerra Dibblee purchased this guitar in New York City while on their honeymoon in 1868-69. The guitar is considered the earliest known example of Martin’s work. Santa Barbara’s second grand hotel, the Potter, opened in 1903. East Coast families, including Rockefeller, Carnegie and Vanderbilt, traveled in private railroad cars to “winter” at the hotel. Situated on thirty-six oceanfront acres, guests enjoyed impeccable grounds with its 30,000 rose bushes, deer park and zoo. Built by Milo M. Potter at a cost of $1.5 million, the hotel accommodated six hundred guests. Potter sold in 1918 and the hotel burned to the ground in 1921.